Is BBC Posting Fake News on Ukrainian History? Recently, deeply-flawed articles on the website of BBC Ukraine have been passed off as fact. Christopher Gilley is a research fellow at the University of Hamburg. He is the author of “The ‘Change of Signposts’ in the Ukrainian Emigration: A Contribution to the History of Sovietophilism in the 1920s” (Stuttgart: Ibidem Verlag, 2009). In an era when politicians and journalists of all political stripes fling around accusations of “fake news” at their rivals, it is especially important that major news providers adhere to their own codes of conduct regarding impartiality and accuracy. Organizations such as the BBC that relay news in foreign languages face an especially difficult challenge: its regulatory bodies may simply not contain people with the language or subject knowledge to oversee and hold to account its non-English output. Some recent articles on the website of BBC Ukraine illustrate this. On March 13, 2017, BBC Ukraine published the piece “Desiat’ mifiv pro Ukrains’ku revoliutsiiu” (Ten Myths of the Ukrainian Revolution). The piece gives no author but describes itself as being based on materials supplied by the Ukrainian Institute of National Memory (Ukrains’kyi instytut natsional’noi pam’iati, hereafter UINP); indeed, it largely copies a section of the guidelines for schools and universities on the UINP’s website that instructs teachers on how to commemorate the centenary of the Ukrainian Revolution in accordance with a presidential decree of 2016 . There is no attempt to distance BBC Ukraine from the views expressed in the materials. The text lists ten “myths,” most of which are simplified statements from the Soviet historiography on the revolution in Ukraine. The piece then gives a refutation of these. Each response to the “myths” consists of a series of decontextualized facts, omissions, simplifications and logical inconsistencies that, taken together, are an attempt to create the UINP’s own nationalist “myths” regarding the revolution in Ukraine, above all in relation to the Ukrainian People’s Republic (Ukrains’ka narodna respublika, hereafter UNR), the Ukrainian state for which many supporters of independence fought after 1917. To give but one example: “Myth” No. 9 is that “The leadership of the UNR did not take any proper measures to stop the Jewish pogroms at the time of the Ukrainian revolution.” The BBC Ukraine article disputes this supposed myth by claiming that the pogroms were mostly carried out by peasant insurgents whose loyalty to the UNR was inconstant; it cites two UNR resolutions condemning the pogroms and points to the committee created to examine the pogroms and a handful of cases where Ukrainian perpetrators were punished. BBC Ukraine’s refutations are, however, complete distortions. It is not always easy to distinguish between regular and irregular forces at this time, but units which the UNR officially classified as parts of its regular army did indeed perpetrate pogroms. The UNR’s own report on its attempts to combat pogroms reveals that the committee set up to investigate them had, many months after the apex of the violence, not brought anybody to justice. The only pogromist whom the BBC Ukraine article cites by name as an example of a Ukrainian commander disciplined for his anti-Jewish violence, Ivan Semesenko (responsible for the bloodiest UNR pogrom), did indeed spend most of 1919 in prison. However, the documents on his case reveal that the UNR government was not interested in the massacre he had committed but rather his refusal to obey orders after it; he was imprisoned as a deserter, not a pogromist. This is not just a question of academic disagreement. The UINP, which provided the materials for the BBC Ukraine piece, is less a scholarly body than a Ukrainian state organization whose task is to place history in the service of contemporary political goals. Above all, it aims, in its own words, to encourage “the development of patriotism and national consciousness among Ukrainian citizens.” It is behind Ukraine’s so-called de-Communization laws. These threaten legal punishments (some specific, some vague) not only for those who deny the criminal nature of the Communist regime in Ukraine, but also for those who denigrate the memory of the “fighters for the independence of Ukraine” or question the legitimacy of the struggle for Ukrainian independence.Seventy scholars of Ukraine based in Western Europe, North America and Ukraine itself condemned these history laws, pointing to the danger they pose to free scholarly inquiry and expressing concern at their attempts to heroize individuals and organizations involved in mass murder. The legislation has drawn criticism from other institutions ranging from the United States Holocaust Museum to the OSCE. The laws are part of the UINP’s program of lauding historical Ukrainian nationalists while denying their involvement in past atrocities. In particular, the UINP’s director Volodymyr V’iatrovych has claimed that Ukrainian nationalist groups active during the Second World War did not have an anti-Semitic ideology, collaborate with the Nazis or undertake coordinated campaigns of mass murder against Jews and Poles. Numerous historians based in Ukraine and the West who specialize in the period have pointed out that his interpretations are based on extraordinary distortions of the documentary evidence. Even more troublingly, the head of the UINP’s Department for the Preservation of Places of Memory, Pavlo Podobied, has, via social media, accused Jews of being the main perpetrators of Soviet crimes against Ukrainians in the 1920s and 1930s. The above-mentioned BBC Ukraine article clearly reproduces the UINP’s highly questionable stance on Ukrainian history. It is not the only BBC Ukraine piece to do so. 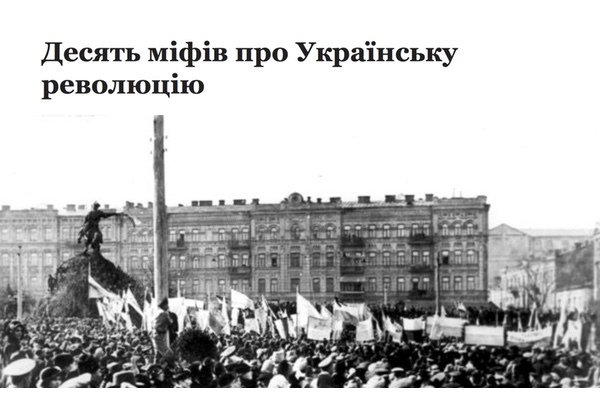 On March 2, 2017, V’iacheslav Shramovych wrote an article, “Storichchia Ukrains’koi revoliutsii: iak vshanovuvatymut’ UNR?” (The Centenary of the Ukrainian Revolution: How Will They Commemorate the UNR? ), advertising the UINP’s planned events marking the centenary of the revolution in Ukraine. At the same time, it quotes the views of employees of the UINP (including V’iatrovych and Podobied) on the meaning of the events, giving them space to elucidate their approach to the Ukrainian past. There is no attempt to offer alternative interpretations of the period or to acknowledge the political nature of the UINP’s work. Some of Shramovych’s contributions to BBC Ukraine on contemporary matters are no less questionable: he is responsible, for example, for an articlethat portrays the Ukrainian Neo-Nazi organization S14, implicated in a number of attacks on left-wing activists and journalists, in a somewhat sympathetic light. This reminds us that an uncritical approach to the past often entails a refusal to ask searching questions of the present. In the war in Ukraine, all sides have employed history as a legitimizing instrument; historical distortions have real implications for current politics. Over six months ago, I tried to bring this matter to the attention of the BBC through their complaints procedure. I received a reply that the matter would take more time; since then there has been silence. This is presumably indicative of the difficulties of regulating a website written in a little-known language about topics poorly understood in the West. However, with articles such as “Ten Myths of the Ukrainian Revolution” and those by Shramovych, BBC Ukraine faces the very real danger offering itself up as a platform for Ukrainian state propaganda.